Noah's Story Is The Life Of The Week On Live Action News! You are here: Home / Family / Noah’s Story Is The Life Of The Week On Live Action News! Noah’s Story Is The Life Of The Week On Live Action News! It blows my mind to see how God has used our little boy in the short 2 1/2 years or so that he’s been out of his mother’s womb! The story of what we hoped to do through this blog (show the world the Down Syndrome is ok!) has been mentioned literally around the globe! Millions of people have been given a window into the life of a family raising a child born with Down syndrome, and my hope is countless children have been brought to full term as a result of connecting with a resource on our blog, or interacting with the thousands of families on our Facebook page! When we started on this journey a few years ago we had no idea the plans God had to use Noah’s life and story to bring hope and encouragement to so many. As I’ve mentioned before, you’re story has power, so tell it! We’re so proud of this kid! 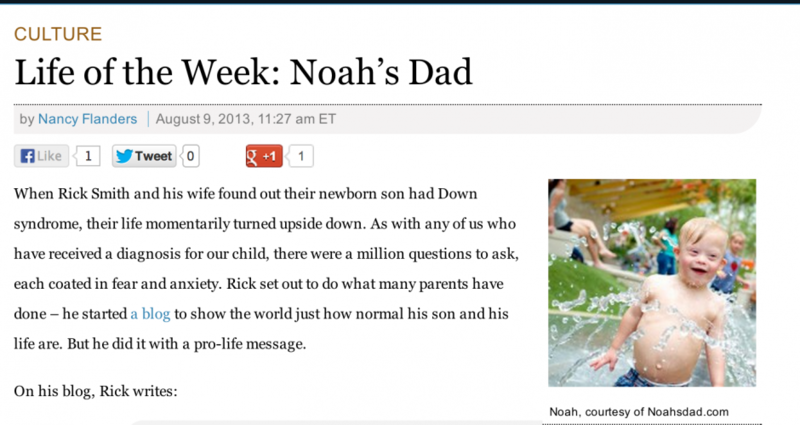 Today I was humbled to see that Live Action News decided to feature Noah’s story as their “Life Of The Week.” I was encouraged by the article and especially encouraged that they published several quotes I made about the sanctity of life as well. Please Take a Second To Tell The Press Thank You For Running Articles That Support Life! After you read it, share it, like it, leave a comment on their article telling them you appreciate articles that promote life, post it on your Facebook wall, tweet it, pin it, etc….Not just this story but all articles you read that promote the value of life! By doing this you are both thanking the media and the author who published the article, but you’re also communicating to them that we appreciate articles that promote truth! Thanks for helping us show the world that Down syndrome is ok! How exciting that you all are in the news! Changing the world, day by day. You are correct, stories do have power. I am a psw with special needs children and young adults, I love my job , and I love the kids i support. I love following Noah and seeing what he is up to. Love that little kid. You’re family is one of the many families who’ve helped me survive my grieving days from receiving the news about our son. But now, we are a strong family with Alphonse around and we will not trade him for anything else. Noah has inspired me in every way. And I love watching his milestones and looking forward that my boy will be able to do those things too. Articles like this will definitely help other people who doesn’t know anything about our children to understand. Very recently, my child has been a subject of ridicule by relatives just because they wanted to hurt a member of our family. I don’t really know how to react accordingly and I wish I have the knowledge and wisdom like you do. But I did some measures because I do not want them to make it a hobby. My baby is just 7 months old and he’s already had his first taste of cruelty, much more – from the so called relatives. Gracias a su historia y su vida, me han acompañado por el mismo camino y me han dado valiosa información y una visión diferente de el SD. Gracias por todo. Tus amigos de Panamá . You have been transforming lives for the better. My daughter is also diagnosed with down syndrome at Birth . She will be completing 2 years on 22 nd September 2013. Apart from the extra chromosome in each and every cell there are no other medical complications till date . We as parents are quite relaxed and your wonderful real life story about Noah has helped us to properly understand the condition . Noah is personally my Hero ! . Regards Sudhir Shetty. I too have an 11 year old grandson who’s name ironically is also Noah..He truly brings so much joy to our family. HE IS THE LOVE OF MY LIFE. Every day is an adventure with him. He has achieved all of his milestones with great enthusiasium and much excitement. He amazes us each and every day. Your Noah is truly a lucky young boy to have the parents he has. Continue to post Noah’s achievments as he grows and he will inspire those who feel overwhelmed. I’ve been reading your blog for awhile and found myself asking about a year ago (and I couldn’t find the post I asked it on) and was wondering what camera(s) do you use. or do you just use your phone? Thanks for the comment, and great question. I use a combo of my iPhone 5, and my Nikon d7000.